Part of working at a Civil War battlefield is being a steward of history. Not only are we stewards of the battlefields themselves, the monuments and historic buildings, but we also are stewards of the memory of those who participated in the events that the battlefields seek to interpret and commemorate. 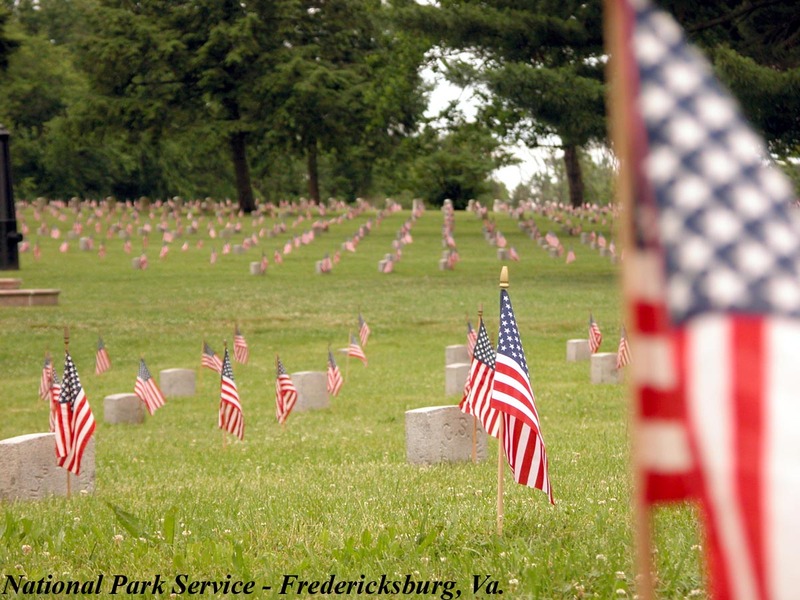 At the Fredericksburg & Spotsylvania National Military Park (FRSP), perhaps there is no one place within the park where that memorialization is more evident than in the Fredericksburg National Cemetery. On this Memorial Day, we thought we’d share with you an event that for many on the park staff brought home this notion of stewardship of the battlefields and the memory of the men who fell upon them. On September 18, 2003, Hurricane Isabel came ashore in North Carolina, passed through Virginia, and left a path of destruction in its wake. FRSP was hit hard by the heavy winds and rain. Fortunately, the historic buildings, such as Chatham and Ellwood, escaped with only very minor wind damage. 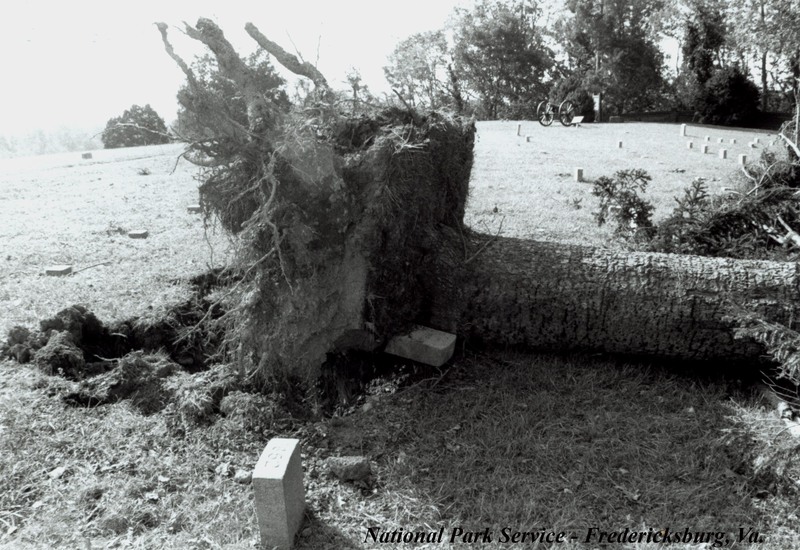 Most of Isabel’s impact was felt in over a thousand downed and uprooted trees throughout the park. In the Fredericksburg National Cemetery, a large tree blew down and the root throw opened a three-foot deep hole over Graves #1650 and #1651. Park staff was unsure whether the burials in those graves had been disturbed. We called our National Park Service archaeologists. Fredericksburg was not the only park dealing with potential disturbance of archaeological sites, as the regional support office fielded calls from many parks in Virginia and North Carolina. Since no human bones were visible at the two graves, park staff was instructed to use hoses to wash the dirt off the tree’s root mass, thus exposing any bones, if they were present. If bones were discovered, we were to stop and immediately call the archaeologist and he would drive down from Philadelphia as soon as he could. The process of examining the root mass began with sweeping a metal detector over thecompacted earth and roots. Six large (3”) cut nails and one unidentified iron fragment were found. If the remains of the two soldiers had been interred in coffins or boxes, the nails suggested that the burials had indeed been disturbed. Washing a root mass, compacted with rocky Virginia clay, using a garden hose is not an easy task. As the day wore on, we began shaking the roots to help loosen the clay. I reached for a root, shook it and immediately realized I was not holding something made of wood. I was holding a tibia, a bone that forms part of the human leg. All work immediately stopped. A call was placed to Philadelphia and our regional archaeologist said he would be at the cemetery the following day. 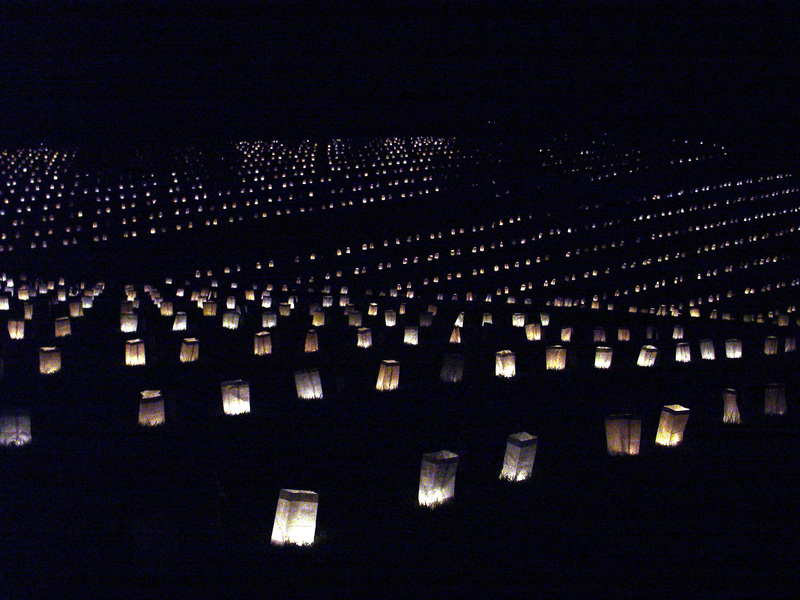 The annual Luminaria at the Fredericksburg National Cemetery, set this year for Saturday May 28. Somewhere among the 12,000 unknown graves in the Fredericksburg National Cemetery probably lie the remains of a young Union soldier, James R. Woodworth, from Varick, New York. Woodworth served in the 44th New York Infantry of the Fifth Corps. “Ellsworth’s Avengers,” the regiment was called, and they gained fame by virtue of steady service on many battlefields, including Fredericksburg and Gettysburg. Woodworth joined the 44th in the late summer of 1862, leaving behind his farm, young wife–Phebe Burroughs Woodworth–and baby Frankie. Woodworth’s letters and diaries record his toils in the army as so many thousands of others do–the blessings of life, the curses of war, and the desire to go home mingling (and sometimes conflicting) with the commitment to do one’s duty. In many ways they are unremarkable. Except for one passage. James Woodworth died on May 8, 1864 in the fighting at Laurel, a the Battle of Spotsylvania Court House. Months before, inside the cover of his diary, he had written a note to his wife, bidding her (and all of us) not to forget in case he fell. It is, I think, one of the most beautiful pieces of writing to emerge from the Civil War. Should it be my lot to die in the present struggle, let the thought that I die in defense of my country console you. And when peace with its happy train of attendants shall once more visit this land, let it be your greatest joy to teach my child that I was one who loved my country more than life. This is the only legacy I can bequeath to him, but it is one that a prince might well be proud of. 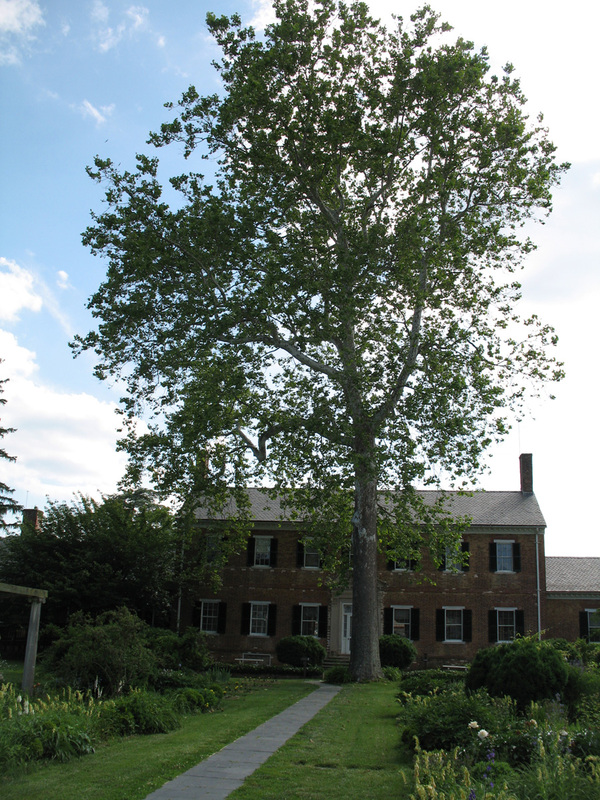 If I might speak personally for a moment: one of the great joys of my job is looking out my office window every day and seeing the great sycamore that towers over both Chatham and me. Every spring I watch its leaves straggle into bloom, faithfully two weeks later than every other tree around, always waiting long enough to make me wonder if, finally, this year is it–the year it will not leaf out–but then it does. I see it sway scarily in summer storms, watch its leaves turn and drop each fall, and behold the steady procession of its broken branches that get hung up in their fall…and then teeter, sometimes for month or two, before just the right wind blows them to the ground. This computer and that sycamore are the two of constants of my worklife. Click to enlarge all images. The Union 1st Corps on the south side of the Rappahannock, looking north. That's Little Falls Run entering the river on the far side, and Sherwood Forest is marked by the cluster of trees on the distant hill. We have prattled on extensively about Franklin’s Crossing–otherwise known as the “Lower Crossing,”–but have paid no mind so far to the forgotten crossing farther downstream at Pollock’s Mill. We received a number of questions about it during our tour last weekend, and so take a look at this crossing of the Rappahannock before we move onto other topics. This crossing, used by the Union First Corps during the Chancellorsville Campaign, was located near the mouth of Little Falls Run, almost directly below Henry Fitzhugh’s Sherwood Forest (click here for a post on Sherwood). At least two superlative sketches of the site exist. It was interchangeably called “Reynolds’s” or “Fitzhugh’s” crossing. 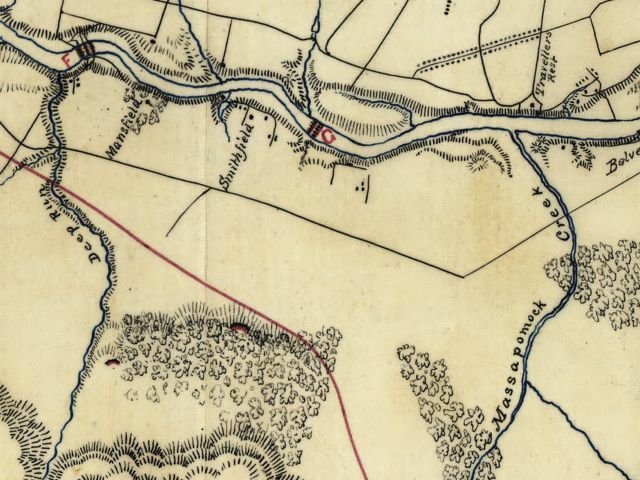 The crossing site was at the mouth of Little Falls Run, about 1.7 miles below Franklin’s Crossing, below Dr. Hugh Morson’s “Little Falls” farm. Update: this map, supplied after going to press by Noel, clearly puts the pontoon bridges just below Little Falls Run. Library of Congress. Update, May 22: We had a courageous crowd of more than 75 for our exploration of the Lower Crossing site on Saturday. It was indeed a slog–with a couple folks finding the mud with their backsides–and the vegetation was thick, but everyone found their way out and I think had a good time (certainly Eric and I did). And, to top it off, the world didn’t end last night as scheduled, so we are good to go. Many thanks to all of you who came along. We are all set for our first-ever exploration (a better word than tour) at Franklin’s Crossing on Saturday morning at 10. For those of you coming along, be ready for a bit of a slog. The river is roaring (hopefully it will recede by Saturday), and spring is in full bloom. Boots and bugs are a priority. This is unimproved ground, so we’ll be moving through whatever is there this time of year. Bear in mind that this event will be something of a discovery for all of us. Eric and I have only been to the site once, for about 45 minutes. So there’s a certainty that we (and you) will spot some things not noticed before. We will bring the full load of images for people to carry with them. 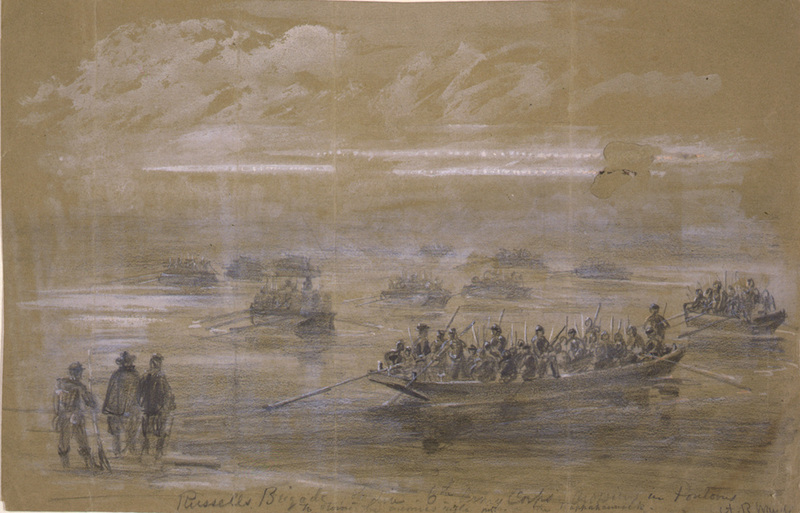 in the meantime, here’s a great, moody sketch of the crossing of David Russell’s Union brigade in the pre-dawn light of April 29, 1863–a crossing under fire. This is one of FOUR crossings at the site, and we’ll talk about all of them in varying degrees. Once again, we are grateful for the efforts of Spotsylvania County for organizing access to the site. We also hope you’ll stick around and have lunch at one of the eateries in the Bowman Center. 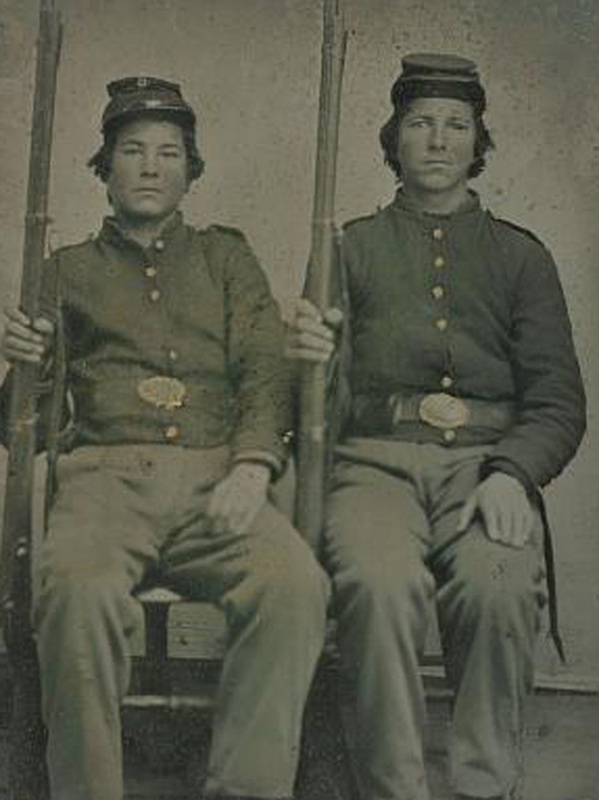 I have always been fascinated with our collective fascination with things military, and especially the Civil War. Though most Americans would proclaim ours to be a non-militaristic society, we spend as much or more time ruminating on our military past as any people on earth. There are surely many reasons for this, but one of them is hinted at by the two quotes that follow. Battle is a transformative event. And the shared experience of battle produces bonds that those who have not experienced cannot fully grasp. I saw this with my father. I could not and did not fully realize until I attended a reunion of USS Albert W. Grant, DD-649, that my father’s service on Grant was the central experience of his life, and the bonds he shared with his shipmates were exceeded only by those with his family. I have always found this to be one of the most affecting of all images taken during the Civil War–the remnants of a Union line of battle at Gettysburg. Its location has remained a stubborn mystery for 148 years (eluding Frassanito and dozens of other sleuths), but now Scott Hartwig, the fine historian at Gettysburg, seems to have it figured out. He presents his conclusions over at that park’s new blog. You can find background on the image in Part 1 of his post and his conclusions in Part 2.